WHERE: The Parlor Room, 32 Masonic Street Northampton, MA. 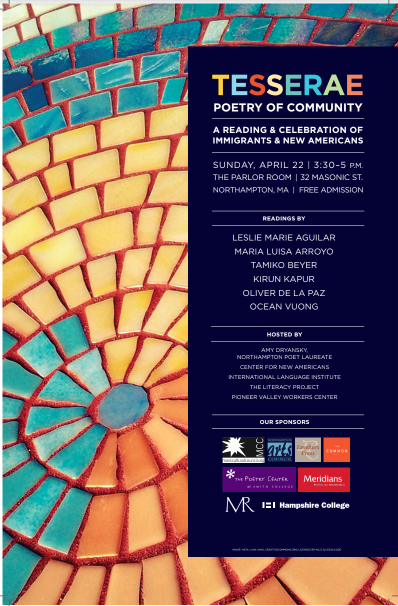 Northampton’s Poet Laureate, Amy Dryansky, will host a special event on behalf of several local agencies that work to welcome and support immigrants and new Americans in the community. 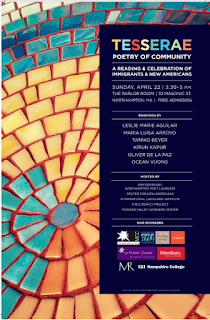 The event, Tesserae: Poetry in Community, is a reading and celebration that will highlight the work of The Center for New Americans, The Literacy Project, International Language Institute, and the Pioneer Valley Workers Center. The event is scheduled for Sunday afternoon, April, 22, 3:30-5:00pm at the Parlor Room in Northampton. It will feature readings by award-winning poets Leslie Marie Aguilar, Maria Luisa Arroyo, Tamiko Beyer, Kirun Kapur, Oliver de la Paz and Ocean Vuong. According to Dryansky, the purpose of the event is to invite the community to learn about the experiences of immigrants and new Americans, and enjoy excellent poetry. She explains that she chose the name, Tesserae, after the pieces or shards that together, make up a mosaic. She believes it’s an apt metaphor for the many kinds of people who live in the Pioneer Valley, and the important contributions they make to our communities. The event is free and open to all. Support for the program is provided by the Northampton Arts Council, a local agency supported by the MA Cultural Council. Additional support is provided by The Common, Hampshire College, Levellers Press, The Massachusetts Review, Meridiens, and the Poetry Center at Smith College.